MCHS Membership Drive - Our Survival Depends Upon Folks Like You! The funds raised by membership in the 200 Club are specifically set aside for capital improvements at the Major County Historical Society. Such funds have poured the concrete under and around the pavilion and have paid for the bathhouse/restroom building. 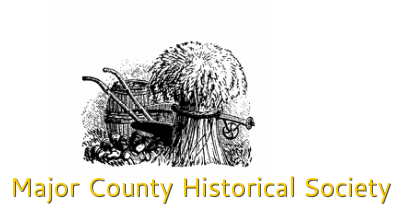 In addition to providing money for capital improvements, members who donate $200.00/year to the 200 Club receive free admission for two to all Major County Historical Society sponsored events on the grounds, a yearly MCHS membership, and are guests of the MCHS annual dinner meeting. Anyone interested in becoming a 200 Club member should contact the Historical Society or simply complete the membership form.